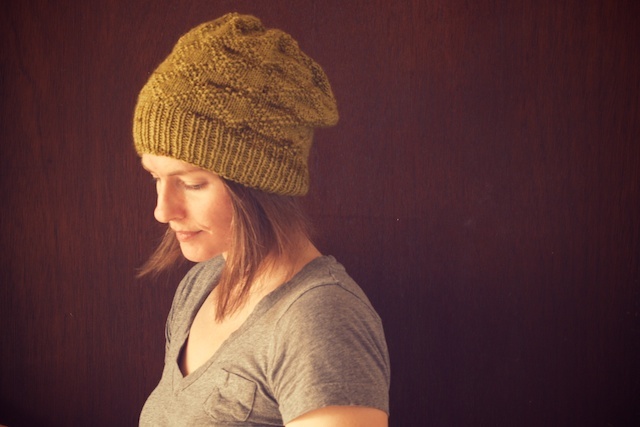 Kingsley, by Andrea Mowry, was a welcomed break from cabling. I keep saying that, don't I? I've interrupted Aidez a million times with my incessant string of hats. 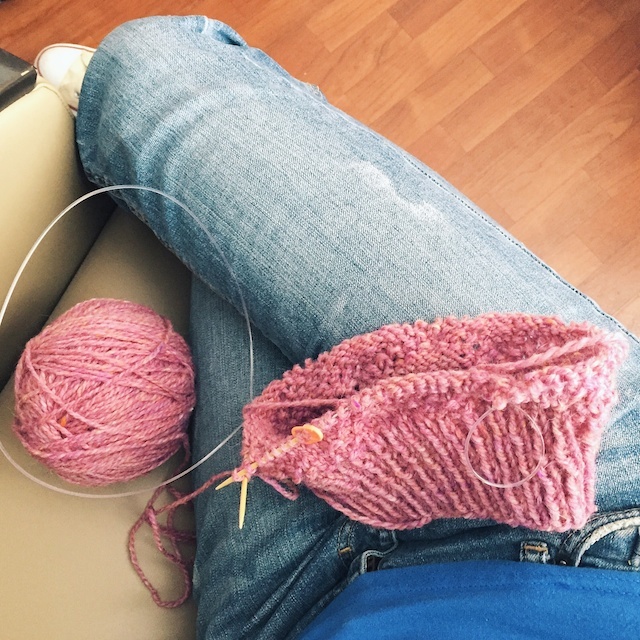 I guess it's because I am having to squeeze knitting into quick breaks spent waiting for my son to get out of soccer practice or in waiting rooms. Besides, Aidez is massive, once you get toward the end. It is just a mess in a lobby... believe me, I've tried. Whereas Kingsley fulfilled a few of my knitting requirements of the moment. It was portable, entertaining, used stash, didn't take too too much focus, and could be finished in a day or two. Perfect for ADD knitting. 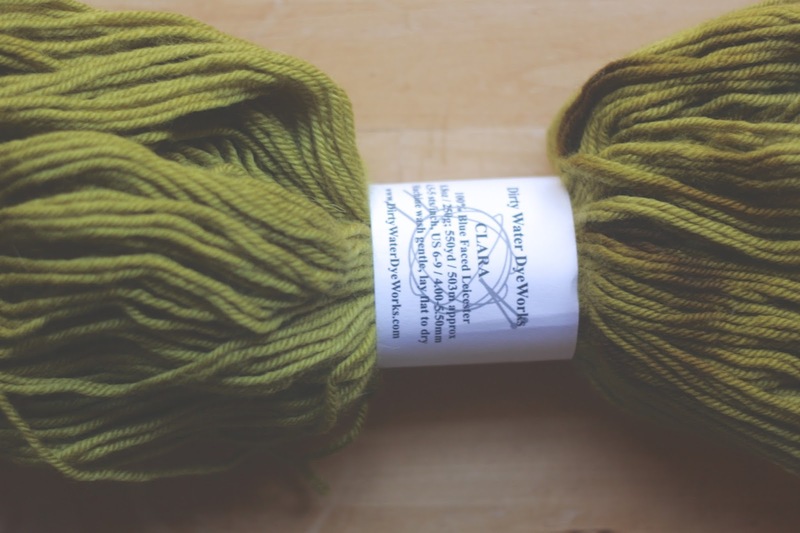 I knit the first one in some tonal, chartreuse Dirty Water Dyeworks Clara, leftover from my Eastwood Cardigan. The second was in Peace Fleece's Georgia Rose color way. 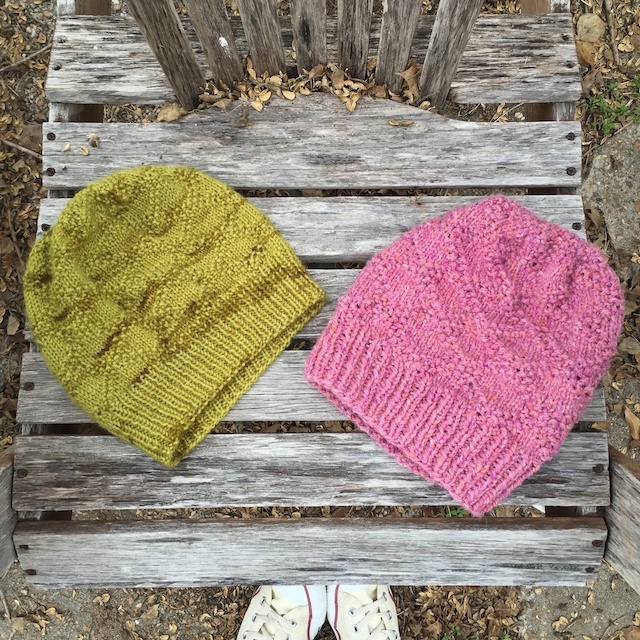 These two yarns were similar in weight, but incredibly different. The Clara was a smooth worsted, almost like working with sport, compared to the Aran Peace Fleece that was so rough and rustic. Peace Fleece almost feels waxy when knitting. However, it blooms and softens immensely with washing. I loved the little orange flecks in it. I'm not sure which I prefer. The Clara was easy to slide along the needles and has these great patches of greenish-brown mixed in, where the other was more uniform in color, but took effort. However, the Peace Fleece really shows the textural pattern. Actually there were three Kingsleys, but I don't really want to linger on the subject of the first one I knit in Peace Fleece that grew like the dickens with washing. Suffice it to say that I learned my lesson and not only followed the directions for the smaller cast on size, but even subtracted 12 stitches from that. Here you are seeing it pre-blocking. I've had a stressful week, spending much time with my grandparents in the hospital as my grandmother recovers from an infection. (She is recovering, by the way, and should be released tomorrow.) So, these rushed photos are all I have for these fun projects. But, hey! I'm posting again! The details: On the finer Clara worsted version, I used size 4 needles for the ribbing and 6s for the body. 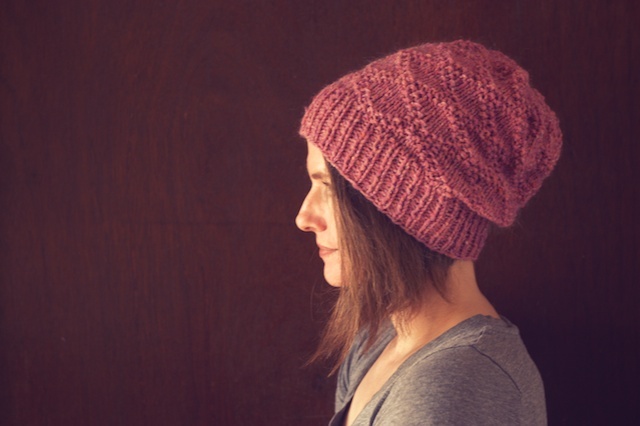 I followed the directions for the slouchy version with a larger number of cast on stitches. It fits me, but could easily have been made smaller. For the Peace Fleece Aran version, I used only size 4s and cast on 12 stitches less than the smallest cast on size. 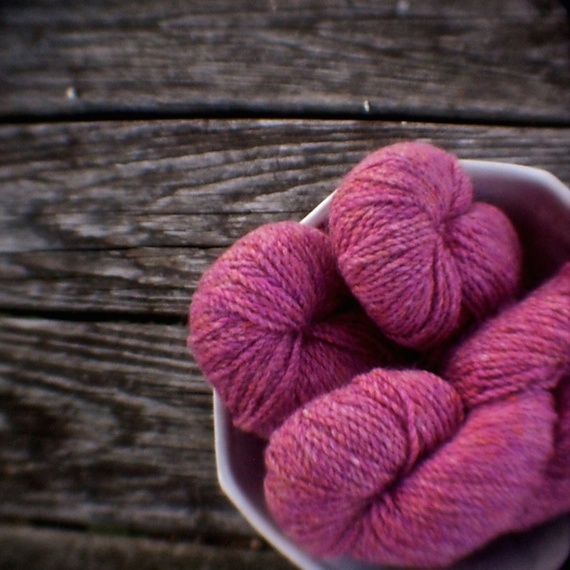 (See above about the yarn blooming with washing.) I still knit the slouchier version. I know it will soften and "slouch" more with washing, too. Have you ever heard the story behind Peace Fleece? It's pretty interesting. I picked these skeins up on a trip to Belfast, Maine. A farmer from Maine returned from a trade mission to the Soviet Union in 1985 with the desire to foster peace between nations in the best way he felt he could. So, he blended American and Soviet fiber to form Peace Fleece. It has a hearty, rustic feel. I truly love that. I've read that in recent years he began including fiber from Israeli and Palestinian farmers as well. Andrea has also designed The Great Up North mittens, which I realllllly want to make. They immediately caught my eye when she released the pattern on Raverly. Only I don't have any stash that I think will do it justice, so I may wait 'til after Christmas and make a tiny yarn order for some. ...aaaand I'm a freak. Happy knitting, friends. the last photo is just the coolest! 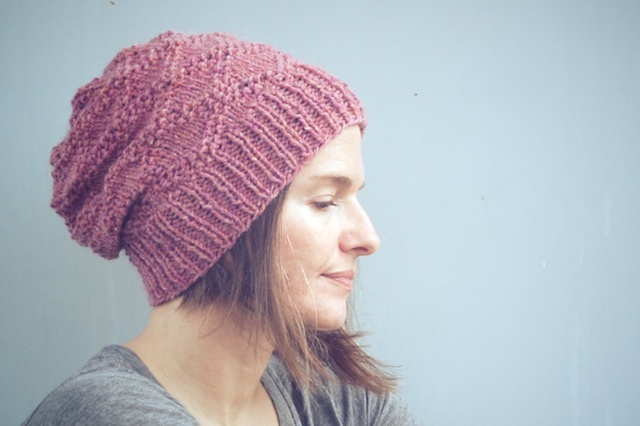 Hats are so rewarding and you can wear them all the time, even when it isn't all that cold. no such thing as too many hats! Love love the green one! I need a good worsted one for Winter too, maybe Bray from Brooklyn Tweed! I really love those hats! 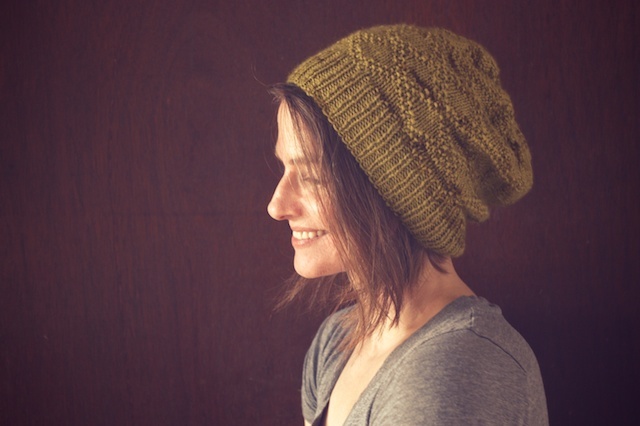 I've also finally started my hat knitting for this winter and totally forgot that it's such a rewarding experience. They basically fly off the needles! Apparently, I am in agreement with you! 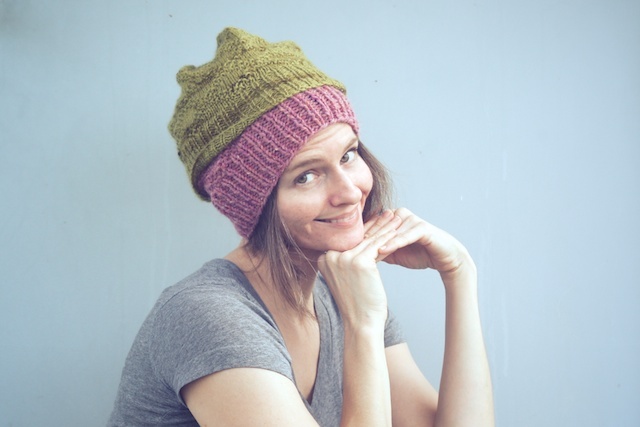 It's been a while since I knit hats, then BAM I'm making thirty. Because I run in the cool weather, I do use hats thru much of our winter, so they'll get some wear. They also make great gifts. Thank you, Brandy! She is better. I like the differences between these. 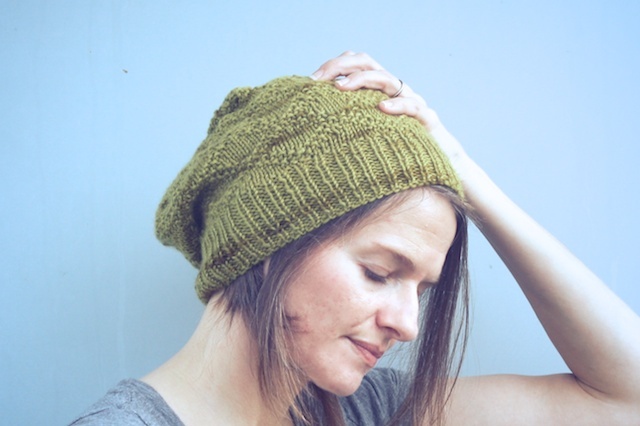 One feels heavier for colder weather, and the green is perfect for right now. It's true. 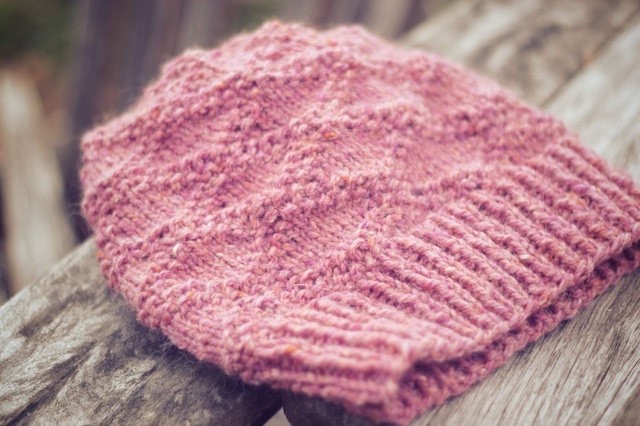 I am supposed to settle down today and seam a sweater, but I keep thinking about hats. Thank you, Heather! She's better and so I am too. I agree about them seeming like two different patterns. The weight difference is striking too. Thank you, Corinne. I think that's true, to a point. Southeast Texas is no place for wool except between Dec. and March. And that's just off and on. I can get away with wearing my sweaters in highly air conditioned buildings, though.